Ounianga Lakes in the Sahara Desert are featured in this image photographed by an Expedition 21 crew member on the International Space Station. 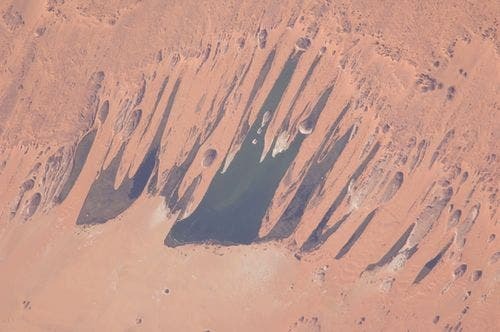 This view highlights one of the largest of a series of ten, mostly fresh water lakes in the Ounianga basin in the heart of the Sahara Desert of northeastern Chad. According to scientists, the lakes are the remnant of a single large lake, estimated to be tens of kilometers long that once occupied this remote area approximately 14,800 to 5,500 years ago. As the climate dried out during the subsequent millennia, the lake was reduced in size and large wind-driven sand dunes invaded the original depression dividing it into several smaller basins. The area shown in this image measures approximately 11 x 9 kilometers, with the dark water surfaces of the lake segregated almost completely by orange linear sand dunes that stream into the depression from the northeast. The almost year-round northeast winds and cloudless skies make for very high evaporation (an evaporation rate of greater than six meters per year has been measured in one of the nearby lakes). Despite this, only one of the ten lakes is saline. According to scientists, the reason for the apparent paradox of fresh water lakes in the heart of the desert lies in the fact that fresh water from a very large aquifer reaches the surface in the Ounianga depression in the form of the lakes. The aquifer is large enough to keep supplying the small lakes with water despite the high evaporation rate. Mats of floating reeds also reduce the evaporation in places. The lakes form a hydrological system that is unique in the Sahara Desert. Scientists believe the aquifer was charged with fresh water, and the large original lake evolved, during the so-called African Humid Period (approximately 14,800 to 5,500 years ago) when the West African summer monsoon was stronger than it is today. Associated southerly winds brought Atlantic moisture well north of modern limits, producing sufficient rainfall in the central Sahara to foster an almost complete savanna vegetation cover. Pollen data from lake sediments of the original 50-meters-deep Ounianga Lake suggests that a mild tropical climate with a wooded grassland savanna existed in the region. This vegetation association is now only encountered 300 kilometers further south. Ferns grew in the stream floodplains which must have been occasionally flooded. Even shrubs that now occur only on the very high, cool summits (greater than 2,900 meters, greater than 9,500 feet) of the Tibesti Mts. have been found in the Ounianga lake sediments. The Sahara measures in at over 9 million square kilometers, and covers the majority of northern Africa. With an intermittent history that some believe may go back as far as 3 million years, a recent study questions how it made its transition from lush greenery to hot sandy desert. According to the European-US-Canadian team of scientists behind the study, the Sahara finished a slow transition 2,700 years ago to become the desert that we know today. This is in direct contrast to previously held thoughts that the desertification of the Sahara came abruptly. Six thousand years ago we know that the massive northern area of Africa was very green; an area filled with trees, savannas and lakes. Sadly, most of the physical elements from that period of time though have been lost, and thus for a long time the exact tale of the Sahara’s geographic evolution has too been lost. However the scientists looked at layers of sediment in one of the largest remaining Saharan lakes, Yoa, located in Chad. This sediment managed to take them back through six millennia of climate history for the region. Posted by Casey Kazan with Josh Hill.